Driving up the Silverado Trail in mid-October, on my way to visit with Michelin Star Chef Stefano Masanti, the smell of fermentation lingered in the cool autumn air. I was excited to sit down with a Michelin Star chef, as this would be my first interview with a chef of such importance. 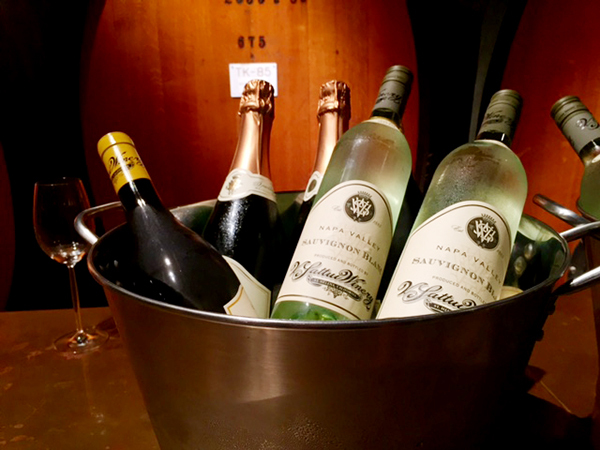 We were meeting at V. Sattui Winery, where Masanti spend his “off-season” during the summer months when his Il Cantinone restaurant shuts down in the ski-vacation village of Madesimo, Italy. Because the village is only bustling during the ski season—it is, by the way, nestled in the Italian Alps—Masanti keeps himself busy by assuming the role as chef at V. Sattui Winery during Napa Valley’s most beautiful time of year in summer and early fall. Fall vines on the Silverado Trail. I’m always curious how chefs get their start. Did they always dream of becoming a chef? Truth is, when I ask this question, I almost always get the same response from chefs: No, but they grew up with a parent or grandparent who spent a lot of time in the kitchen. And not coincidentally, many come from families who have a history of chefs throughout their lineage. 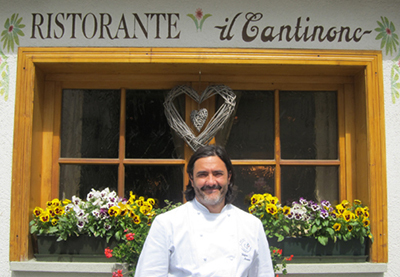 Such is the case for Masanti, whose Michelin-Starred Il Cantinone restaurant has become a food-lover’s destination in its small village of Madesimo, Italy. To put things in perspective, Masanti had humble beginnings where he strived to make the very best pizza in his family’s osteria. Chef Stefano Masanti during one of V. Sattui's Chic Pizza & Vino nights. The Masanti family grew up near Lake Como in the very northern reaches of the Italian Alps, so close to the Switzerland border that the area has always been a ski destination for tourists. It was here that Masanti’s family opened an osteria in as early as the 1870s. It was “a very simple restaurant with two bocce courts and homemade gelato; they also made all of their own salumi. They started in 1870-something. Nobody knows exactly when,” Masanti says. The family osteria came about as a way to make money from the tourists who were visiting the region during the winters months for skiing. “Just after the war, my grandfather bought the rail station bar/restaurant on Lake Como. . . [to get there], you had to take the train from Milan and it stopped right in front of my grandfather’s osteria.” The location couldn’t have been any better and the osteria flourished for decades. But the success didn’t last through the 1950s, because the motorization of Europe after the second world war made “my grandfather realize that his business was going down, because people were no longer taking the bus or the train,” Masanti says. Being the innovative and flexible man that Masanti’s grandfather was, he left behind the restaurant/bar near Lake Como and “bought a summer house in a new ski resort in Madesimo; it was pretty famous in those years. He transformed this house into a hotel.” After many years of success with the hotel, Masanti’s grandfather retired, but decided again to relive his dream of building and running another osteria. “When he passed away, I received it [the osteria] as heritage and I started to work in that place. . .at 18 years old, just after I finished high school. My father couldn’t work there, so he told me I had to go work there. I was in university in Milan. At nighttime I studied and in the daytime I worked,” Masanti reminisces. 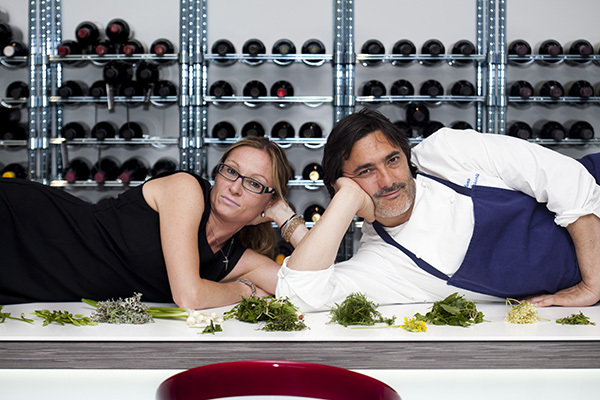 But Masanti’s experience with food and restaurants started well before he inherited the osteria. “I grew up in a family that was involved in cooking and restaurants for over 150 years. . .[and] I worked in the kitchen of the hotel with my family from when I was eight years old.” So when he inherited the osteria at 18 years old, Masanti already knew a thing or two about both the front and back of house at a restaurant. I asked Masanti how he went from inheriting an osteria at 18 to turning it into one of Italy’s most prized Michelin-Starred restaurants. He responded with ease, “It came practically naturally. We started the restaurant with pizza and when I was a teen, I wanted to make the best pizza in town and I did it that same year.” Masanti smirks, “It was really easy. . .Then I said I want to make the best pizza in the valley and then I made the best pizza in the area, and then probably one of the best pizzas in Lombardy—my region.” After mastering the art of pizza by using “local mushrooms, local cheese, local flour and so on,” the osteria became pretty famous, Masanti says proudly. But he started to get bored—which is always the true mark of a brilliant chef and certainly one who has Michelin Star potential, because that boredom turns into a desire to seek out new ingredients, craft innovative dishes and put something truly inspiring on the plate. It was Masanti’s restlessness with pizza that began Il Cantinone’s journey towards a Michelin Star, which Masanti has maintained for eight years in a row. Today, Masanti strictly works in the back of the house, while Rafaella—Masanti's wife and a Certified Sommelier—manages the wine program and the front of house. Il Cantinone functions like many of the “farm-to-table” restaurants here in Northern California wine country—sourcing the freshest produce from local farmers; utilizing local, artisanal food products on the menu, such as butter, cured meats and cheeses; as well as finding the most local and fresh meat. Il Cantinone is known for making their own homemade gelato—a family recipe that that has been passed down for generations—as well as their own Bresaola, which is a cured beef akin to salumi. “In my area, Bresaola is made by artisans—small butchers. Altogether, we probably produce about a thousand pounds per week,” Masanti says. I asked Masanti what “local” means for Madesimo. He quickly responded, “What is real Italian is local. The variety in Italy is so crazy, but the production is so small, that it’s only local. It never exports out.” Filled with pride for all that his region has to offer, he continued, “My region is the Alps. . .We have six or seven varieties of potatoes, we have two of the best world’s cheeses—bitto and casera—bitto in particular, which is the only cheese that can age 12 years. It’s really small production, again, only 500 wheels a year. Everything is mainly related to vegetables, cheese, butter and dairy; the farmers farm animals like chicken, rabbits and goats. We have seven varieties of goats in our region. And you make prosciutto with one, salumi with another one, milk with another and so on. Venison, wild game—we have like six or seven different animals.” Clearly, Madesimo is packed full of local goods, so it’s easy to see why Masanti is able to create a unique menu that honors the local community while still elevating the ingredients to earn himself a Michelin Star. And here in Napa Valley between April and October, Masanti brings his expertise and innovative dishes to V. Sattui Winery. The story of how Masanti ended up as V. Sattui’s chef during Il Cantinone’s “off-season” is quite serendipitous. Tom Davies, President and Part-Owner of V. Sattui, “came into our place visiting us by chance. We met him and the funny thing is that we had come here [V. Sattui] before,” Masanti says. “We have a friend in Alameda and I cooked for her for six years before meeting Tom. . .The first year we worked for her, one day she brought up to Napa and we had lunch at the Martini House in St. Helena [what is now Goose and Gander] and it was a Michelin Star restaurant. . .and then we went to other wineries, Coppola and Chimney Rock, and V. Sattui! So when Tom visited Il Cantinone, he told me he was a vice president of a small winery in California.” And the rest, as they say, is history. After Masanti learned that Davies, at the time, was vice president of V. Sattui, the two became distant friends. Davies would visit at least once a year and ask Masanti to teach him something about his culinary techniques or provide recipes, and then bring them back to V. Sattui to share with Napa Valley. After a while, Davies proposed that Masanti join V. Sattui as their chef for their annual Harvest Ball. After agreeing two years in a row, Masanti began coming to V. Sattui each “off-season” to act as the winery’s full-time chef—cooking for weddings, events and private tastings, as well as contributing Bresaola and gelato to V. Sattui’s mainstay goodies that are sold in their on-site deli. Although Masanti says that the full-time, year-round work in both Italy and Napa Valley is “pretty intense,” he admits he wouldn’t want it any other way. “We like challenges,” he says with one of those mischievous smiles that always alludes to a chef's extreme endurance and drive to push the envelope a little further. And even at V. Sattui, the fun never seems to stop, with the many events and gatherings that Masanti and his Rafaella are happy to host—Masanti in the back of the house preparing unique culinary creations and Rafaella gracefully controlling the front of the house, as if it were a perfectly seamless transition to uproot themselves and do exactly what they do back home at Il Cantinone here at V. Sattui in Napa Valley. But seamless it is and the couple exudes a true passion for what they do. Parmesan crème brûlée with balsamic vinegar (left); mushroom and pumpkin rye-flour lasagne with ginger and vegetable consommé (right). Fried buckwheat-coated oyster with avocado and lime cream (left); potato mousse with toasted almond, parsley, chocolate and beets (right). *Article banner photo by Bob McClenahan.